This article is probably a bit late for it to have its biggest impact, but hopefully it will still be use to some folks. Sapphire is no longer implementing the FleX technology in the latest AMD cards (the 7000-series), or at least they haven't to date. However, if you're looking to get into Eyefinity and purchase an older card on sale, or second hand via something like eBay, this article should be of use. FleX is a technology and branding that Sapphire Technology uses in a line of its AMD graphics cards. The largest hurdle Eyefinity adoption has been the need for a monitor with DisplayPort, or having to buy an adapter. While this is less of an issue with the newer single-link DVI adapters, the dual-link adapters were a royal pain. The FleX technology was introduced in the days of the dual-link adapter, and served as a great advantage to anyone wanting to get into Eyefinity with existing (or cheaper) monitors. The technology itself is quite simple. Sapphire simply put another TMDS chip on the board, giving it three clocks. 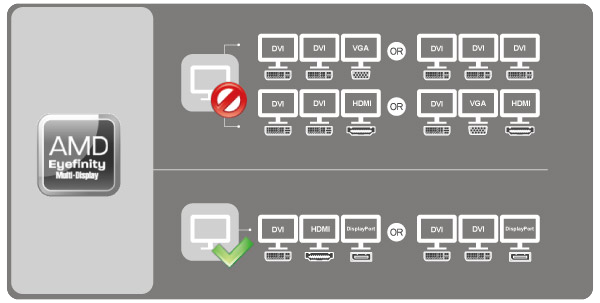 This allows the user to run an Eyefinity setup using the included HDMI and DVI ports. The below graphics show the additional connection options the FleX technology allows. The technology is internal circuitry to the card, and thus is not readily visible. However, custom technologies, features or PCBs can end up adding length and/or bulk to a video card. 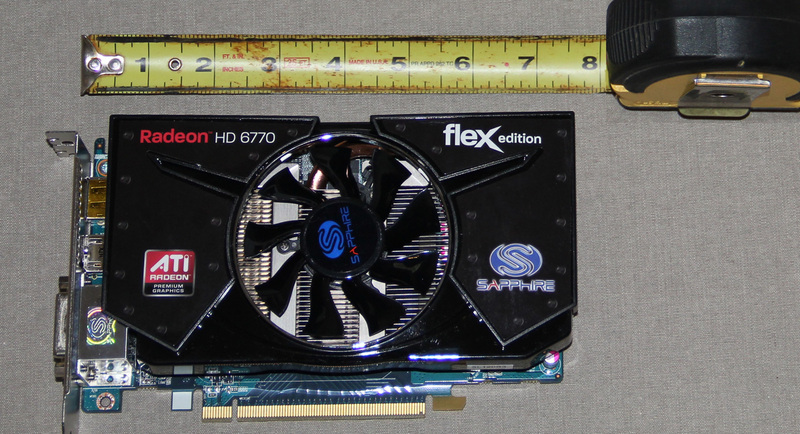 The integration of the additional TMDS does not create any measurable size difference, as shown below with this picture of a Sapphire Flex Radeon HD 6770. Additionally, it doesn't add any significant price increase to the card. As of the writing of this article, the Radeon HD 6770 has a price range on NewEgg of $109 - $139. The FleX edition fits within this offering with a street price of $129. Not the cheapest, but also not the most expensive. 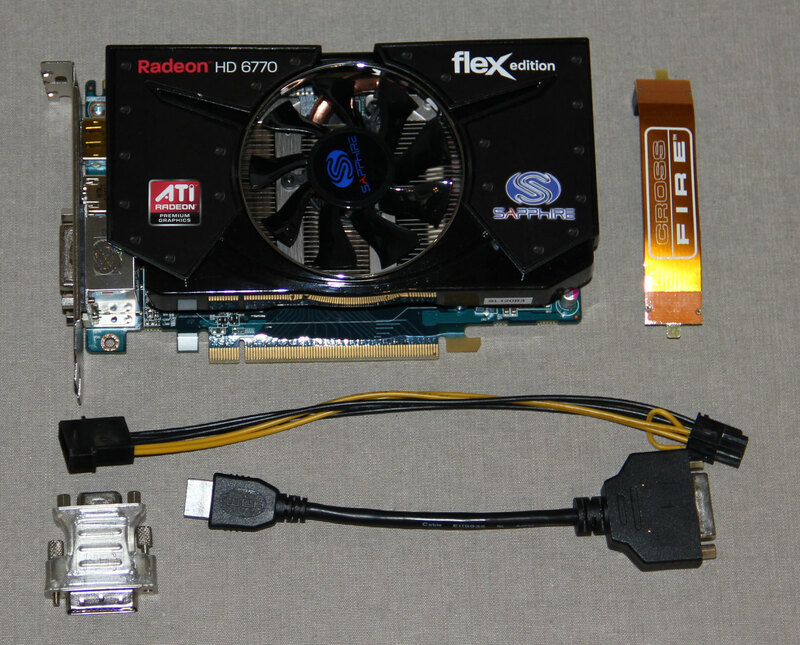 Using the Radeon HD 6770 as an example, Sapphire includes a VGA > DVI adapter, a 4-pin molex to 6-pin PCI-e power adapter, a CrossFire bridge, and an HDMI > DVI dongle. 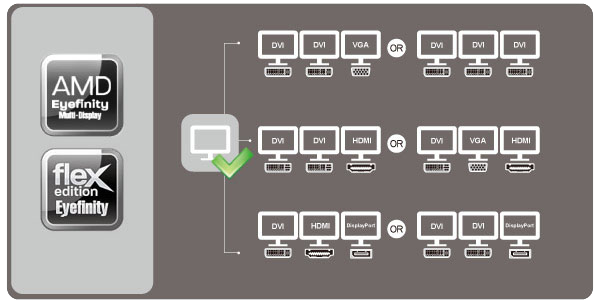 The dongle allows the user to run Eyefinity with three DVI equipped displays. As of the writing of this article, the last cards to get the FleX treatment were the Radeon HD 6900/6800 family cards. It could be that the 7000-series is too new for the custom treatment, but I suspect it may be that the advent of the $30 single-link DVI adapter has lessened the need for a FleX card. That, and the proliferation of lower-priced DP monitors. In a nutshell - perfectly. I wish I had some fancy diagram or video to post. Well, maybe I don't. Simplicity has its virtues. All I had to do was plug in the HDMI > DVI dongle, and then hook up the three DVI monitors. They all fired up, and I configured the Eyefinity group as I always have. It worked flawlessly with duplicated or extended desktops, and Eyefinity. So, if you've got your hands on three DVI monitors, you can look for a 2GB Radeon 6900/6800 FleX Edition on sale somewhere and jump into Eyefinity. Why, Why, I didn't see/know it 1 year earlier! I heard from some forum's that the Flex edition cards don't overclock very well. But thanks for educating the masses about this. They seem to be taking their sweet time with it, but Sapphire is releasing 7000 series cards that offer FLeX support. The first one I found is a 7950 card.